Have you ever made a paper bag book? I hadn't, but I'd seen them floating around pinterest and finally decided we had to try! One of our current favorite activities is creating books. I like to staple a few pieces of paper together and have my son draw pictures on the pages and then we talk about the pictures and I write down what he says or have him write down his own stories. He can spend hours on this. There is no real plot yet in his stories... and if there is, it is really confusing and hard to follow. Most of his books revolve around volcanoes, so I was hoping to try something new this weekend (based on his current pirate interest) and create a pirate themed book. These concepts seemed easy to introduce since I feel like we spend a lot of time each day talking about problems and how they could be resolved! Fold the paper bags in half and then staple them together like a book (staple on the folded part). I put them together so that that about every other page had a little pocket. Cut a piece of cardstock to fit the front of your book (ours was about 4.5x4.5 I think?) and decorate the cover with your book's title. We used stickers. You could also draw a picture. Stick to the front cover with double stick tape. Cut pieces of cardstock or thin paper for the inside of the book to make however many pages you want. I had about 5-6 pages. Have child draw a picture of a problem on one page (ours was a pirate problem). Write down what the problem was about on the bottom of their picture. Stick pages into the book with double stick tape. Cut pieces of cardstock to fit inside the pockets. Have child draw a picture of how the problem would get solved. Write down the resolution they tell you on the bottom of their picture. Add little ribbon tabs onto the resolution cards using a stapler so that the child can pull the resolutions out of the pockets. Stick the resolution cards in the pockets after each problem. Help them keep it simple so that they can remember the story. Break writing down into short illustrated chunks so that they have the pictures as clues..
Don't create it for them. You can give suggestions, but ultimately let them decide what they want to say. Help them create stories about things they like or are interested in. Write together one time with them dictating to you and then have them try writing the text the next time all by themselves. You can write yourself a note if you need a reminder of what they said, but getting early writers engaged in doing their own writing is really important! Don't worry about it being perfect. I tend to think that they pictures need to be really well done or thought out or colored if the artwork is going into a book. My son was just as happy with pencil colored simple pictures... so I just let it go. Here's an example of my son's writing in his book. Conflict: Sneaky pirates stole the chocolate chips. Resolution: Pirate Andrew used kind words to get the chocolate chips back. Each page and pull out card shared a different conflict that Pirate Andrew had with the "sneaky pirates" and a simple resolution. This was a really fun activity for us to do together. I see many more afternoons of bookmaking in our future. You can use these to focus on any story element that you think your child might be interested in! 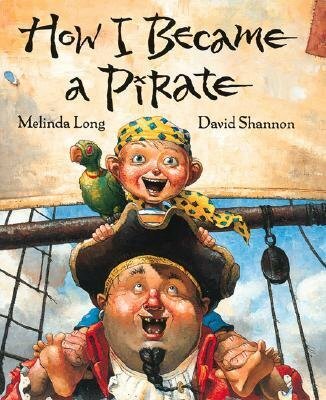 Before you make your own pirate book, you could also learn some more things about pirates by reading How I Became a Pirate by Melinda Long. If you haven't read this book yet, it would be a great one to read this week as part of Children's Book Week. 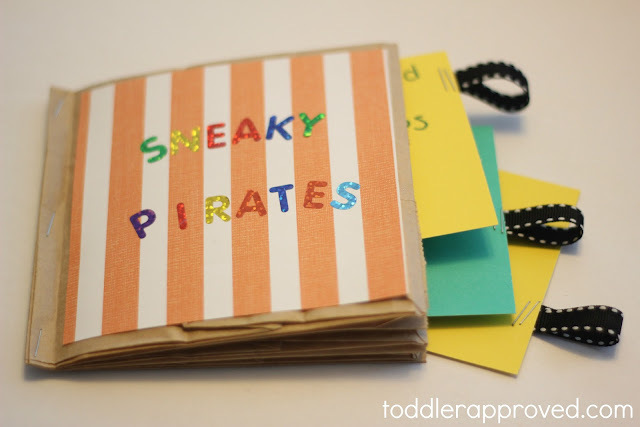 Do you have any other favorite pirate themed books or activities? Mommy & Me Book Club Post: Do Pirates Take Baths? Pirate Box Castle via Mummy...Mummy...MUM! Did you catch my announcement last Monday? I'm expecting a new baby!! This will be number three for our family and we are thrilled! This paper bag book looks great! We're totally into "writing" and illustrating our own stories and this little book is sure to inspire. Your book turned out really cute - love it :-) We really enjoy story-telling, too! I love this idea! The book is awesome and I can think of lots of different ways of using the pockets. J is still a bit young for the creating your own story part, but I'm going to pin this for later. I really like this idea! What a great way to review a story!